He won four Cy Young Awards, was selected to 10 all-star games and was elected to the National Baseball Hall of Fame in his first year of eligibility. 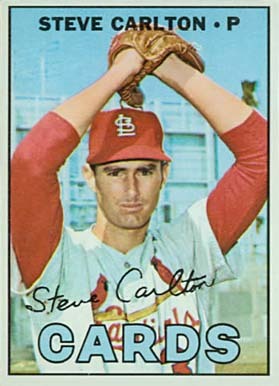 But what you might not know about legendary left-hander Steve Carlton is that he started his professional baseball career in Canada. After he was signed as an amateur free agent by the St. Louis Cardinals in 1963, Carlton was assigned to the club’s Class-A Northern League affiliate Winnipeg Goldeyes the following year. In 12 starts with the Canadian club, the then 19-year-old southpaw registered four wins and posted a 3.36 ERA. Carlton also reportedly met his future wife, Beverly, in Winnipeg and the couple had two sons before divorcing. His performance in Winnipeg was enough to earn him a promotion to the Cards’ Western Carolinas League affiliate in Rock Hills and then to Double-A Tulsa, where he posted a combined 11-2 record that same season. This convinced the Cardinals to bring Carlton north with them the following year and he’d remain in the big leagues for most of the next 24 seasons. Over the next two-plus decades – spent predominantly with the Cardinals and Philadelphia Phillies – Carlton racked up 329 wins – the second-most by a left-hander and the 11th most by any pitcher in big league history. He put together his most remarkable season in 1972, when on a last-place Phillies club that won only 59 games, Carlton registered 27 wins and a sparkling 1.97 ERA to become the first pitcher to win the Cy Young Award while on a last-place team. 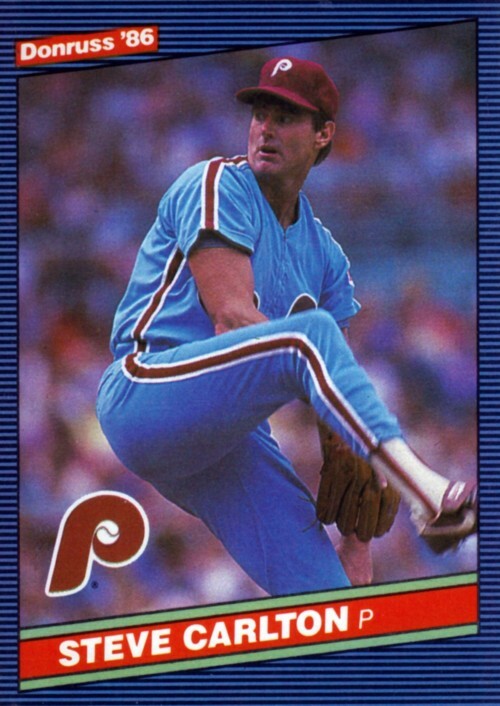 “Lefty” was also the ace of three division-winning Phillies teams and the World Champion 1980 club. And by the time he had retired in 1988, Carlton had recorded 4,136 strikeouts, which ranks him fourth on the all-time list. On top of beginning his career north of the border, Carlton also battled the Montreal Expos at Jarry Park and Olympic Stadium numerous times, and in his final three big league seasons, he enjoyed stints with the Chicago White Sox, Cleveland Indians and Minnesota Twins, which gave him the opportunity to compete against the Toronto Blue Jays. – Carlton made his major league debut with the St. Louis Cardinals on April 12, 1965 in an afternoon game against the Chicago Cubs at Wrigley Field. The future ace walked the only batter he faced (Cubs outfielder George Altman) in the 11th inning, before he was replaced by Bob Purkey. Earlier in the game, Canadian Baseball Hall of Famer Ron Taylor (Toronto, Ont.) relieved Cardinals starter Bob Gibson and allowed one run in his inning of work. The contest ended in a rare 10-10 tie when the umpires were forced to call the game because of darkness. There were no lights at Wrigley Field in 1965. – The Expos were always a difficult opponent for Carlton. Though he finished with a career won/loss record that was 85 games over .500, he was just 26-25 with a 3.37 ERA against Montreal. – In 14 contests at Jarry Park, Carlton posted a hard-luck 5-6 record, despite a 2.89 ERA. The 6-foot-4 lefty was roughed up a little more against the Expos at Olympic Stadium, where his record was also 5-6, but his ERA was nearly a run higher at 3.82. – The Expos were the only team to hit four home runs off of Carlton in the same game. On July 9, 1978, Gary Carter, Andre Dawson, Ellis Valentine and Dave Cash all belted solo homers off of Carlton, who was in his seventh season with the Phillies. However, those four solo homers were the only runs he surrendered in seven innings and the Phillies eventually won 8-7. – The Phillies had defeated the Expos on the last weekend of the 1980 season to secure the National League East title and eventually win the World Series, so the Expos had revenge on their minds in 1981. The 1981 campaign would be shortened by a strike, so the Phillies (the first-half NL East champions) and the Expos (the second-half champs) faced off in a best-of-five National League Division Series. The Expos called upon their ace Steve Rogers (2005 Canadian Baseball Hall of Famer) to pitch against Carlton in both the first and fifth games, and Rogers emerged as the winner in both contests. The Expos defeated the Phils 3-1 in Game 1 and 3-0 in the deciding game. – Carlton and Rogers both pitched for the National League in the 1982 MLB All-Star game played in Montreal on July 13, 1982. Rogers started and limited the American League to one run in three innings, before Carlton took over and hurled two scoreless innings. The National League beat the American League 4-1. – Carlton struck out 16 batters in a game, three times in his career. One of those performances came when he pitched against Canadian Fergie Jenkins (Chatham, Ont.) and the Chicago Cubs on June 9, 1982 at Veterans Stadium. In that showdown, Carlton scattered 10 hits in a complete-game 4-2 victory. Jenkins pitched six innings and allowed three runs and took the loss for the Cubs. – As mentioned, Carlton enjoyed stints with three American League teams (White Sox, Indians, Twins) in his final three seasons (1986 to 1988). In five appearances against the Blue Jays, he posted a 5.27 ERA, however, he didn’t allow a run in the two games he pitched in at Exhibition Stadium. – His only career start against the Blue Jays occurred when he was with the White Sox on September 7, 1986 at Comiskey Park. He allowed three runs in 3-2/3 innings, but the White Sox eventually prevailed 4-3. – By my count, Carlton had five Canadian teammates during his big league career (hometown, team, years played with Carlton): Ron Taylor (Toronto, Ont., St. Louis Cardinals, 1965), Ron Piche (Verdun, Que., St. Louis Cardinals, 1966), Reggie Cleveland (Swift Current, Sask., St. Louis Cardinals, 1969 to 1971), Dave Shipanoff (Edmonton, Alta., Philadelphia Phillies, 1985) and Doug Frobel (Ottawa, Ont., Cleveland Indians, 1987). – I could only find two Canadians who had walked to the plate against Carlton in the big leagues. Though he was a decent hitting pitcher, Jenkins was just 1-for-24 against the Hall of Fame left-hander. Terry Puhl (Melville, Sask.) fared a little better. The 1995 Canadian Baseball Hall of Famer recorded nine hits – including a double and two triples – in 37 at bats against Carlton. A friend of mine who grew up in Vancouver, Dan Miscisco, was also a left-handed pitcher with Winnipeg in 1964 when Steve Carlton played there. Dan became quite good friends with Steve and they still stayed connected many years after their short stint together in Manitoba. So, although Dan never made the major leagues, in all likelihood, he would have been the first Canadian he knew as a teammate. Thanks very much for sharing that, Len. Winnipeg…that’s great. Didn’t know that. What a great pitcher. Thanks for the comment, Scott. Coincidentally, Steve Rogers also pitched in Winnipeg.